romcom | on anything and everything. on The Duff directed by Ari Sandel. I finally watched The Duff few days ago! I’ve read the book and from my review, you can tell I loved it! However, when I saw the trailer for the movie, I wasn’t very happy because it looked like “Mean Girls” and I was afraid that the message from the book would not translate into the movie. However, I was pleasantly surprised, so here’s my review of The Duff movie. on Love, Rosie directed by Christian Ritter. I’ve been absent, I know. I wasn’t really in the mood. But today I’m here with a romantic comedy, that will make you cry. 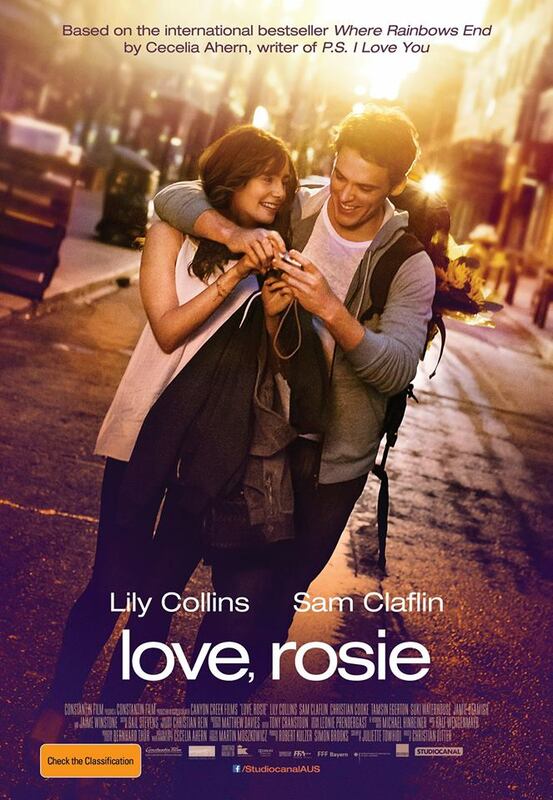 I hope you will go see Love, Rosie and love it as much as I did. Here’s what I thought. Since the moment they met at age 5, Rosie (Lily Collins) and Alex (Sam Claflin) have been best friends, facing the highs and lows of growing up side by side. A fleeting shared moment, one missed opportunity, and the decisions that follow send their lives in completely different directions. As each navigates the complexities of life, love, and everything in between, they always find their way back to each other – but is it just friendship, or something more? Based on Cecelia Ahern’s bestselling novel, LOVE, ROSIE is a heart-warming, modern comedy-of-errors posing the ultimate question: do we really only get one shot at true love? Ok, I admit it! I have a soft spot for a good romantic story between best friends (like in Bully). I’ve been dying to go see this one because let’s face it – Sam Claflin stole our hearts in The Hunger Games series and Lily Collins is absolutely gorgeous and talented. I’ve read a few reviews and I agree with the fact that this movie doesn’t bring anything new into the movie industry and it’s full of clichés (not every movie can be Boyhood). The thing is, this movie had very well executed clichés. It was sweet. Hart-warming. Lily Collins and Sam Claflin did a great job. Their characters were believable and I loved their chemistry. I don’t know about others, but I cried hysterically and cared about these characters throughout the whole movie. Yes, I am a sappy being, sue me! Love, Rosie had a lot of comedy aspects as well, which made me cringe for the characters at times, but that just added to the truthfulness of this story. Plus I had a bit of nostalgia of the early 00’s. It’s really solid romantic comedy and I would recommend it! Don’t expect a life-changing story (unless you and your BFF have feelings for each other and haven’t admit it yet). I have been in the mood for something like this and I don’t regret watching Love, Rosie one bit. Hopefully, you won’t too. Thank you for reading and drop a comment if you’ve seen it already.